Welcome to the Ohio Elks Association news feed. Be sure to checkout all the great stories from lodges all across Ohio along with important updates from the state association. This page is updated regularly so come back often for the latest news in Elkdom! Columbus-Grove City Elks #37 Uses ENF Grant to Make City Safer! The Columbus - Grove City Elks Lodge #37 is proud to give to the Grove City Police our Anniversary Grant with $750 going to D.A.R.E. and $750 going to “Max”, the K-9 unit. Thanks to the Elks National Foundation for allowing us the opportunity to improve our community! 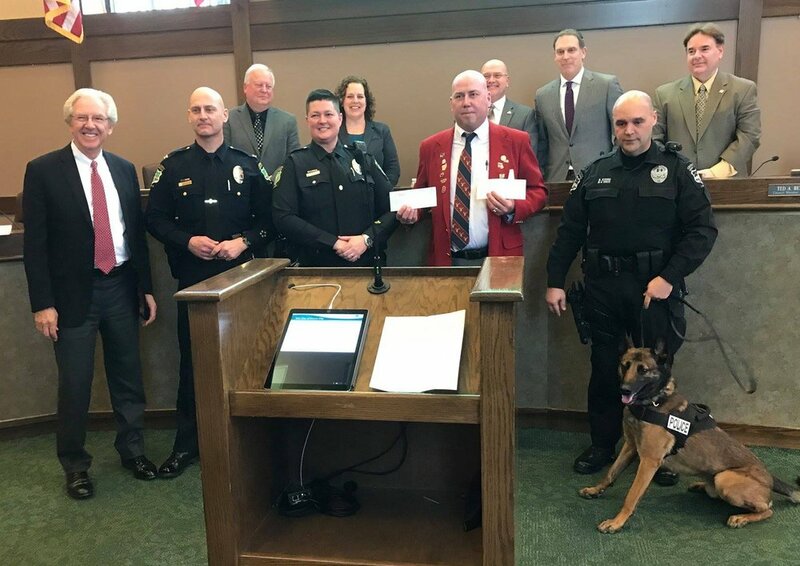 In the picture: Mayor Ike Stage(Elks Member) chief of Police Richard Butsko Jr , Dare Officer Misty Hutchinson, Me (Randy Seymour ER), K-9 Officer Brian Kitko and Max. In the background City Council Members , Roby Schottke, Christine Houk, Council President Steve Robinette, Jeffery Davis and Ted Berry.